Luxury and sophistication shine in this classic and elegant layout. Regal Revival brings together clean lines in black and white, vintage bronze decor, candelabras, white faux English roses, and all things chic. 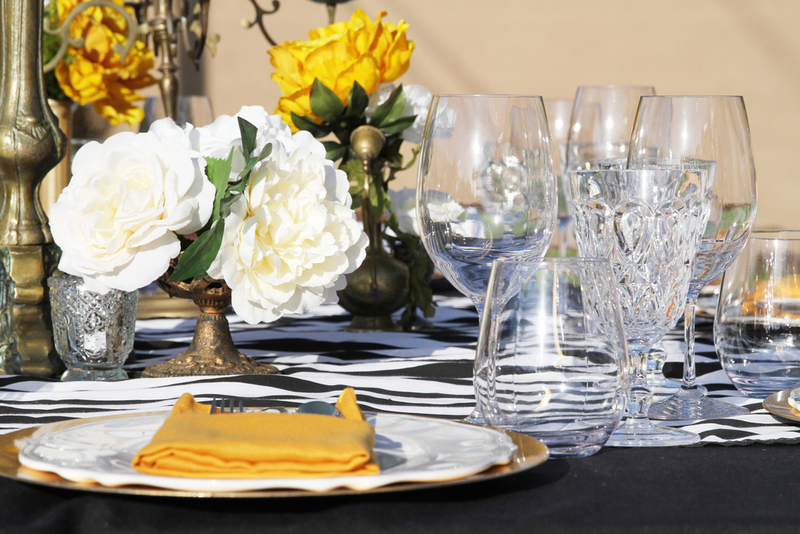 This elegant collection is a perfect dinner party, engagement party, or birthday party setup for you and your regal guests. Black Tablecloths - 90" x 132"
Assorted brass candelabras with flameless taper candles. Gold, brass, & bronze candlesticks, votives & flameless candles, vases, assorted antique brass animals, vintage books, & magnifying glasses. Dinnerware place settings including assorted gold chargers, white, scalloped melamine dinner & salad plates, and gold flatware. Unbreakable red & white wine glasses and unbreakable elegant water goblets. 2 Black & White striped umbrellas. Decorative black & white frame for the menu or messages for the guests.